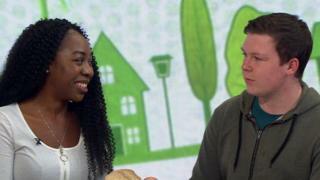 Student housemates from Loughborough University have been challenged to live more sustainably, with weekly challenges set by the BBC's Victoria Derbyshire programme. How did they get on? "It's hard when you're on a student budget, getting anything not wrapped in plastic is so much more expensive," Amy explained. But Amy said they found supermarkets a particular problem as "everything was wrapped in plastic". "And going to the butcher's was more expensive than getting pre-packaged stuff," she added. At the start of the week, Ms Siegle weighed the plastic in the students' home, which totalled 2.8lb (1.3kg) - a figure she described as "rather a lot". "I'm still really pleased with them," she said. "Especially as when I saw all the bottles they [initially] had in their bathroom, I nearly gave up." "We need to take a stand," she said. Marcus Rudd, one of the housemates, had hoped that his shopping habits - buying 10 to 15 T-shirts a year, combined with some designer pieces - were environmentally friendly. The fashion industry - which makes 100 billion garments each year - is a major contributor to greenhouse gases, water pollution, air pollution and the overuse of water. It is exacerbated, MPs say, by so-called "fast fashion" - inexpensive clothing produced rapidly by mass-market retailers. "We buy so much stuff and half of it sits unworn in the back of the wardrobe," Ms Wilby said. "Before we buy anything else it's great to see what you've already got, and fall back in love with your things." Goby enjoyed the challenge. "I was shocked by what you can do by reusing a garment and making it into something new which is actually really fashionable. I actually love it." "Considering Marcus had never set foot in a second-hand shop before - and thought they were smelly places with clothes you would never want to buy - by the end of the week he was finding pieces he really loved. That was a really great victory. "These two shop a lot, and over the past month [since the challenge] he has only bought one item." The students took dramatic action to reduce their energy usage - and it worked. They used much less heating - switching it off at night; wearing jumpers, coats and blankets; and generally keeping the house a little bit cooler. It made a huge difference to their gas usage - cutting it by a whopping 48%. They also lowered their electricity usage by 15%. This added up to a 44% carbon saving - around a tonne of carbon in all. "It was a massive effort - it was freezing in our house," said Marcus Golby. "[Before] we weren't communicating when things were going on and going off, so you ended up with the heating on the majority of the time," explained Amy. "This month we're having more of a balance of keeping warm and keeping the heating off when we're out." Dr Rosie Robison, an energy expert from Anglia Ruskin University, said it raised wider questions on whether the focus should be on individuals using less energy or the "wider responsibilities for landlords or homeowners, housebuilders and government for thinking about how our homes can require less fossil fuel in the first place". A third of all food made for human consumption is wasted every year - costing the average UK family £700 each year, estimates suggest. The students were challenged to cut their food waste by 50% and move to the planetary health diet - a plant-based diet with small amounts of meat and fish. He said that they found the challenge hard, but had reduced their food waste from 8.1lb to 6.8lb, which he described as "a fairly small reduction". Dr Woolley added: "One of the things it shows is even when you're aware of the problem and you're trying to reduce waste, it's so ingrained into how we waste and use food that actually we continue with these large amounts." Housemate Will Smith said their waste totals were boosted by food bought before the challenge which had started to go off, but admitted: "I don't think we did too well." The Sustainable Students series was produced and directed by Owen Kean and Tom Yeates, with research by Curtis Gallant and Simon O'Leary.